P ortland doesn’t have a major league baseball team, or an NFL team, or a hockey team. We DO, however, have two soccer teams -- one of which even sent players to the World Cup in 2015 to help the United States win the finals (it was the Portland Thorns, the women’s team, at the Women’s World Cup). The point is, while we’re usually not seen as anything other than a basketball city, we do love our soccer. Even without the US in the World Cup, there are plenty of bars around town who will be showing the games -- even the crazy early ones, as many matches will take place at the 3, 4, and 5am hours (this thing is in Russia, of all places). The action kicks off June 14, and we’ll be updating this list with more parties, events, and bars as they pop up. Also, to help out ever more, we asked John Strong -- the lead Major League Soccer voice for FOX Sports -- to give us a few of his favorite places to watch. Now, without further adieu, here are the best places to catch the men’s World Cup in Portland (while you wait for the true American champions to play in 2019). 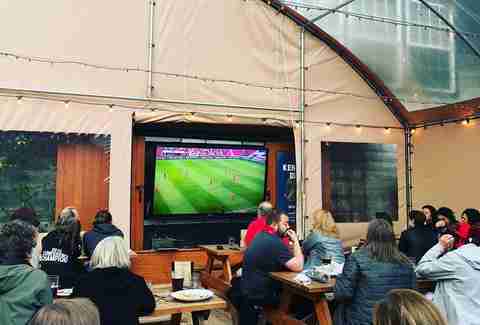 One of the most popular places to watch Timbers games, North 45 is offering some of the best seating to watch the World Cup: out on its sprawling back patio, on an 80-inch TV, with a beer garden so you won’t have to miss a single moment. The bar will be opening at its usual time to start (4pm during the week, noon the weekends), but may adjust going forward if there is customer demand. 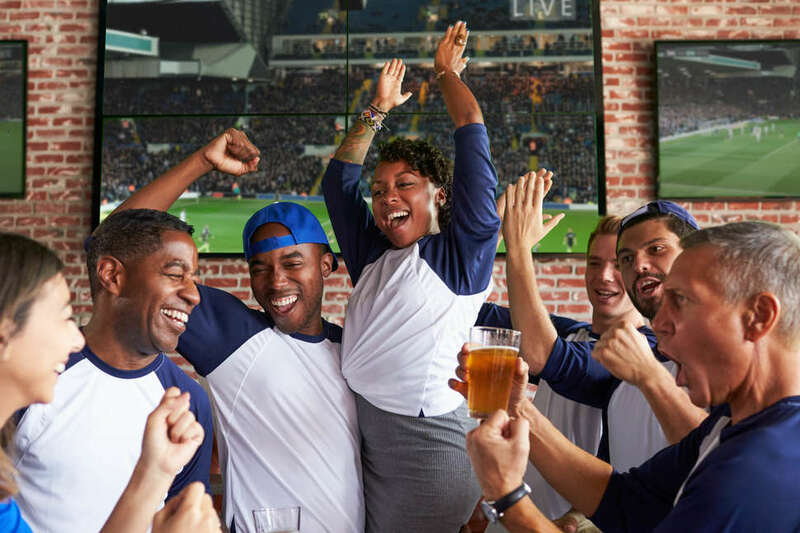 Customers wearing soccer gear will get $1 off their first beer. With a name like 442 Soccer Bar (the numbers refer to a popular soccer formation), it’s no wonder it’s one of the city’s most dedicated and beloved soccer bars. During games, it’s not uncommon to hear four or more different languages being shouted at the televisions. 442 is opening for each game, even the France vs Australia match at 3am. For games that start as early as 5am, the bar is opening an hour ahead of time, with the full Bosnian and Mediterranean menu available, as well as coffee and espresso drinks. For the 3am match, it will likely just stay open -- though last call drinks still legally need to be finished by 2:30am. 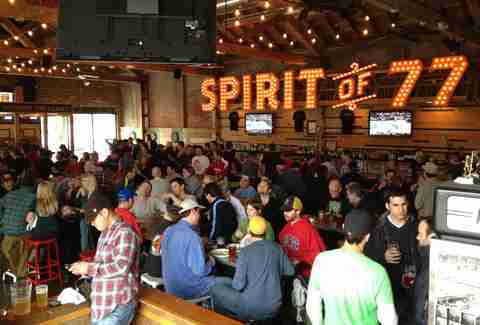 Named for the Portland Trail Blazers’ most momentous year -- when the team won the NBA Finals in a remarkable comeback -- the Spirit of 77 is, yes, a basketball bar. But that doesn’t mean it doesn’t get into the Spirit of Soccer as well. Though it’s not running any specials, it is serving brunch until 11am each day, and will be opening for 8am matches at 7:30, but not for anything earlier. This LO family-owned restaurant might not be the most obvious choice for a soccer tournament, but it’s the best place to go for anyone cheering on Costa Rica. Two of the country’s matches will be at 5am, but the restaurant is currently planning on opening for those, and definitely will be for the match at 11am on June 27. Grab some smoked chicken or a bowl of rice and beans with eggs, tortillas, and sour cream, and get hyped. 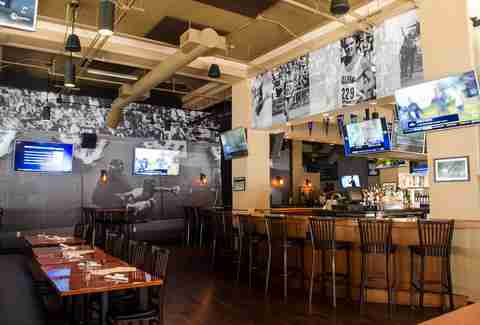 Open in time for lunch at 11am each day, The Independent is a casual, relaxed sports bar lined with over 30 TVs. It’ll also set up a large screen for the games. Like its sister-store, North 45, The Independent isn’t set to open up early, but may do so later down the line and will also offer the $1 off first beers for soccer paraphernalia. The Toffee Club is an English pub set in a stylish warehouse, with Persian rugs on a concrete floor, hardwood furniture, and wide windows. The bar regularly shows soccer games, and the World Cup is certainly no exception, with every game but the 3am match of France vs Australia being shown. Doors open an hour prior to matches, which means the 4am game of England vs Panama on June 24 may have some still-tipsy British hooligans who just wandered the neighborhood for the two hours the bar was closed. Kells Brewery in Northwest Portland is going even more all out than its pub location, showing every game of the tournament. For the ones before 11am (which means most of them), the brewery will be prepping special breakfast items like egg sandwiches, yogurt parfaits, muffins, and bagels. Games that start at or after 11am will have the regular lunch available. Again, it’s an Irish brewery, so jeering at Denmark will be highly encouraged. 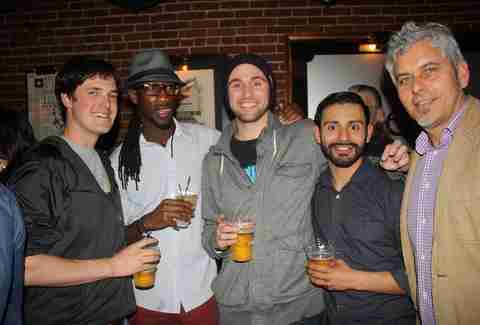 One of Portland’s most popular German bars, the cozy, European styled Prost! is opening early for games that start at 7am or later. The outdoor “biergarten” will be extended into the adjacent food cart pod, with extra screens and taps for al fresco World Cup viewing. Two of the Germany matches start at 7am and 8am, but luckily they’re both on weekends, so there’s no excuse to not start your day with a lager and some schnitzel. Though Lompoc has a number of pub locations around town, it’s the Fifth Quadrant (5Q) location in North Portland (Portland’s fifth quadrant) that houses the brewery, and will be showing many of the WC games. Though it won’t open for the crazy early ones, it will 15 minutes prior to any game at 8am or later. For games that start before the regular lunch hour, 5Q will have some freshly made breakfast sandwiches and burritos you can buy. Kells Irish Pub, one of the city’s most popular Irish bars, is showing any game that starts at or after 11am, in time for their usual lunch service. 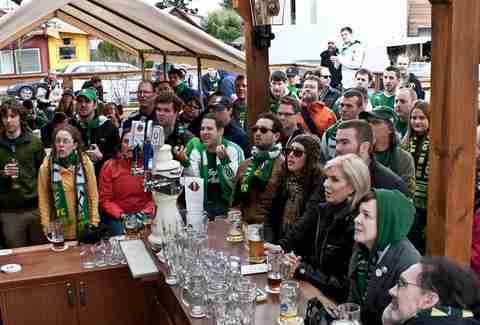 As Ireland failed to make it to the World Cup, losing in the playoffs to Denmark, the bar may not be as raucous or packed. Still, there’s no doubt there’ll be a group of dedicated footballs fans in for each game, if only just to cheer against England. Directly across the street from Providence Park, where the Timbers and Thorns both play, is the Cheerful Bullpen. A little less divey than its sister bar the Cheerful Tortoise -- which serves as PSU’s de facto college bar -- the Cheerful Bullpen is a no-frills sports bar and the OG home of the Timbers Army, with a mural outside depicting the city’s sports history. 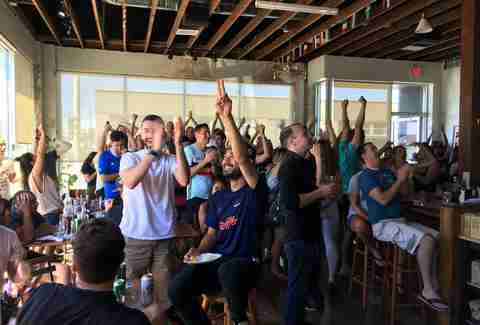 Though the bar will only be opening a little earlier than its normal 11am times for those games, it’s still a great place to watch the World Cup with Portland’s own unique brand of soccer hooligans. 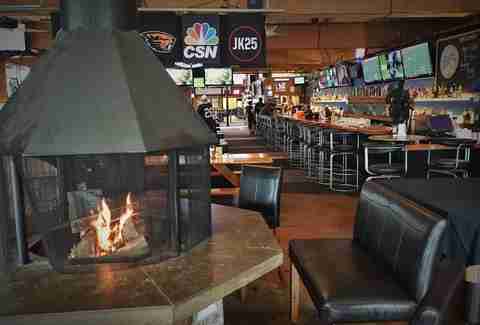 Portland’s OG chain of sports bars, Blitz, has now been consolidated into one bar: The Ladd Taphouse, which recently saw some renovations including more taps, hardwood installations, art, and high-top tables to replace the divey, outdated couches. The bar is larger than any nearby sports bar, and will be playing matches as early as 8am, serving its 43 beers and ciders on draught. Its proximity to 442 and The Toffee Club means it doesn’t bring in the same size crowds for soccer games, so those looking for a more relaxed environment should consider it.